The new version of The Digital Frog is exciting and even more informative than the earlier version. The improvements will almost certainly enhance the learning of the anatomical and ecological aspects of frogs. I wish I had The Digital Frog when I was in high school. I used Digital Frog 2 today for the first time with my Biology students... The program contains everything I used to have my students do and more. The map especially made it easy to navigate. I even had a student who found the frog's underwear! What a great idea to put extra fun features into the program. I am really glad we bought the program, I plan to use it for the rest of my teaching career. In previous years, more and more, I felt guilty purchasing between 80-100 specimens for dissection. Thank you for providing such an eco-friendly alternate for Biology students. The Digital Frog 2 is forward-thinking, environmentally friendly and a wealth of information for biology students. It is one The REVIEW ZONE's Best of 2000 software winners for combining education and fun. An excellent teaching aid. Not only does it provide a comprehensive view of the frog, but it does so in a harmless way... The Digital Frog 2 offers a compassionate, positive alternative while, at the same time, protecting a diminishing species. The program offered an interesting alternative to a real dissection with good graphics. "It helped me understand what we were doing in my biology class, " said one teen. The dissection module is still the best part as far as I'm concerned... the photography is excellent and there are tons of hot spots that detail every little step and item. Beautiful, clear movies masterfully demonstrate dissection techniques. The Digital Frog 2 is the most thorough computer presentation of the frog that we've seen. 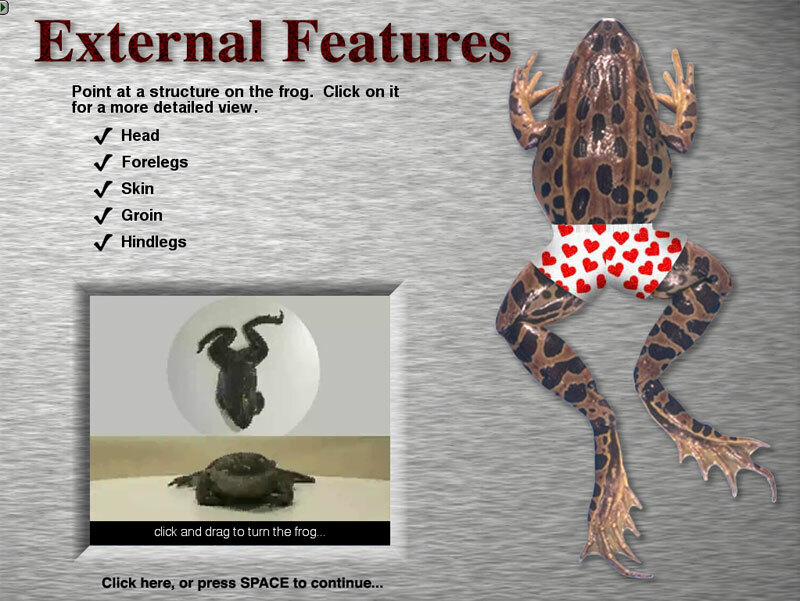 In addition to the excellent interactive environment for learning frog structure and function, it also incorporates behavioral and ecological information, and provides on-screen comparisons between frog and human anatomy. Best of all, this program, unlike traditional classroom dissections, encourages students to care about frogs by urging the adoption of local ponds and the preservation of their resident populations. One of my favorite parts is the comparative anatomy section, which allows students to see how frogs and humans differ internally. The videos are stunning and explain the dissection process with great accuracy. Even the most squeamish in the class have learned the concepts presented. So far I have been through the Frog Dissection which is quite amazing. I'm a little squeamish about that sort of thing, but really enjoyed it. Everything I've seen so far makes me think that you have produced a very useful learning tool. I'm impressed by how intuitive it is to navigate, and how interesting it all is. Both the teachers and students who previewed The Digital Frog gave enthusiastic "thumbs up" to including it in both the biology and environmental studies curriculum. The Digital Frog easily takes the Kids Domain Gold Award for Excellence in Children's software. I was unprepared for the quality and impact of the graphics. There is now a potential for all students to share in the excitement of learning anatomy as a basis for linkages to physiology and ecology. Dissection has finally realized its true role in the school curriculum! The dissection and anatomy sections are truly noteworthy and provide instructions that make the most of the power of technology through images, sound, and movies. The information goes far beyond that found in most textbooks. An excellent example of new technology is The Digital Frog, frog-friendly software for biology students. This product teaches students everything they need to know about frogs, inside and out, and then some. Having personally used this software, I can guarantee it will make learning biology an enjoyable experience. In order to help students prior to and throughout dissection, a number of computer programs are available which allow them to visualize the dissection on the screen. I highly recommend the computer program, the Digital Frog.